Serbian Orthodox faithful in Arad celebrated Friday, 27 January 2017, the Feast of Saint Sava Nemanja, First Archbishop of the Serbian Orthodox Church, founder of Serbian law and a diplomat. 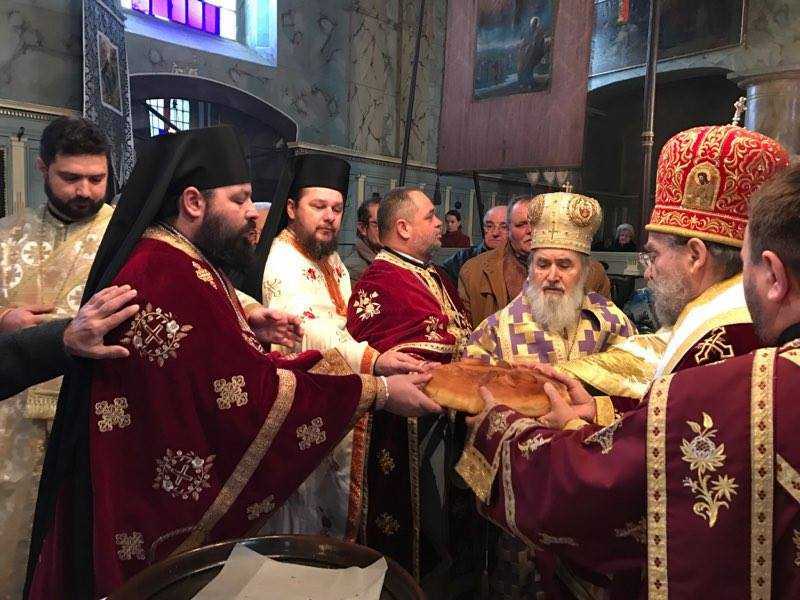 On this occasion, His Eminence Timotei, Archbishop of Arad, and His Grace Bishop Lukijan Pantelic of Buda, administrator of the Serbian Orthodox Diocese of Timişoara, concelebrated the Divine Liturgy at the Serbian Church of Saints Peter and Paul, located in the centre of Arad. Both hierarchs delivered speeches and stressed the importance of the ties between the two Autocephalous Churches and their faithful. His Eminence Archbishop Timotei thanked Bishop Lukijan for the invitation and offered his archpastoral blessing to the faithful present. The first archbishop of Serbia, Saint Sava (Rastko) Nemanja was born in 1175 and passed away to the Lord at the age of 60 in 1235. He is considered one of the most important figures of the Serbian history. He is the first Archbishop of the Autocephalous Orthodox Church of Serbia and founder of Hilandar Monastery on Mount Athos. This entry was posted in Featured and tagged His Eminence Archbishop Timotei, His Eminence Timotei, Saint Sava Rastko Nemanja, Serbian Orthodox Church, Serbian Orthodox Diocese by Orthodoxy Cognate PAGE. Bookmark the permalink.